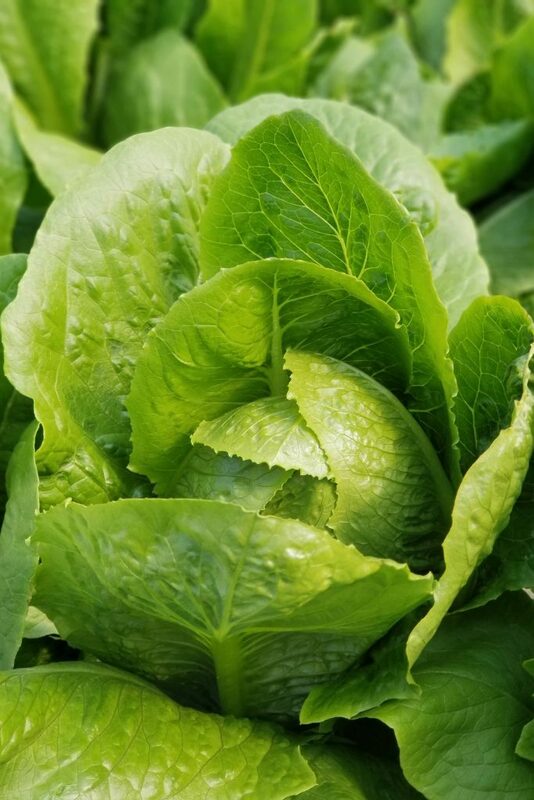 Romaine calm, spring is right around the corner! No need to wait until it’s officially spring to enjoy this Spring Berry Romaine Salad though. So simple to make it, great as a main dish or side for dinner, extras for lunch, and perfect for Easter dinner or brunch! Just a few simple ingredients and it comes together in minutes which makes it perfect for me to bring to Easter this year since I’ll be a little tight on time making other things like sourdough and hopefully some treats. We’re back home and hoping to get back to “normal” life today. It’s been a crazy two weeks, I forgot how exhausting vacation can be but I did manage to get some relaxing in. We’ll have to ease back into things though, luckily it warmed up while we were gone so that wasn’t too rough but there’s still snow on the ground. We were very active with lots of walking at Expo and Disneyland but it’s been over 2 weeks since my last “workout” so barre is on the list today and hoping my back holds up. Food well while we did have many healthy options at Disneyland (with the club level) there was a lot of eating at Expo and lots of wine and desserts at Disneyland. We came back home after 8 days and were only home just over 48 hours before leaving again. No guilt, I believe in balance and enjoying life, but I’m craving routine and healthy whole foods. Oh and toast, we made fresh sourdough and I’m trying to figure out what combo to make first. 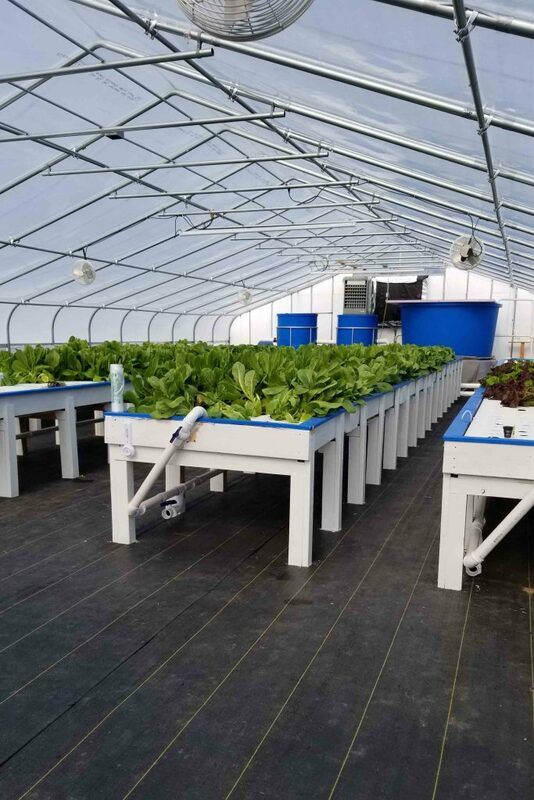 Right after we got back we had to take about a 6 hour car trip to take the girls to my parents for the weekend and while we were up there the girls and I got to check out a hydroponic green house. I shared a little on Instagram Stories. It was pretty amazing and if I had the time, money, and space to start one it would be fun to have one. So I’ll just count the days until we can plant our traditional garden and have my dad bring me down greens when he’s in town or grab some when we’re up there. 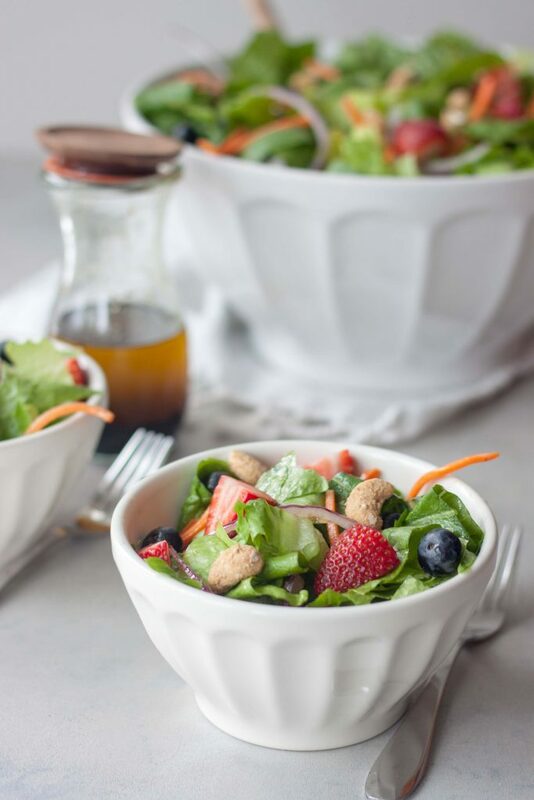 I did get a few heads and I used them to whip up this Spring Berry Romaine Salad. 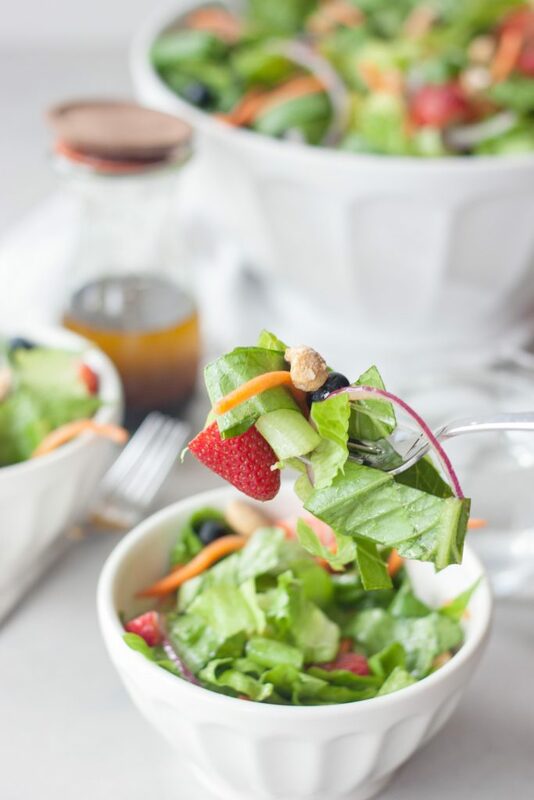 I’ll be picking up more Easter weekend to make this salad again for Easter dinner with my family and to bring to Easter lunch/dinner with the in-laws. This wasn’t what I had planned to share today for Meatless Monday but it was so simple and delicious I decided to when the kimchi soup I made didn’t photograph well. I could eat simple delicious salads every day! I then realized I hadn’t shared the recipe for the Matcha Coconut Cups and the ones with marshmallows I hoped to get up before Expo but I’ll get that up this week and I’ve pretty much already shared it on Instagram and sent it to those who have asked. I’m also debating on getting a post up about Expo. There was a lot this year, it was the largest year to date, and I’m not sure what I want to share yet. If there is something you’re looking for let me know. There were a lot of dairy alternatives this year, probiotics (including bars I really liked), and a lot of new flavors and products from some of my favorite companies. I hope you all have a great week. 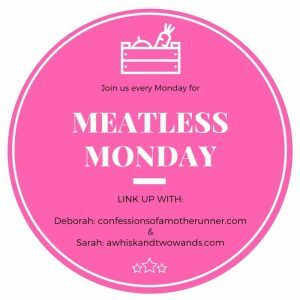 If you’re here for Meatless Monday, I look forward to seeing what’s happening in your kitchen and hope you link up with me and my co-host Deborah. I also hope you’re inspired by the recipes linked up below. 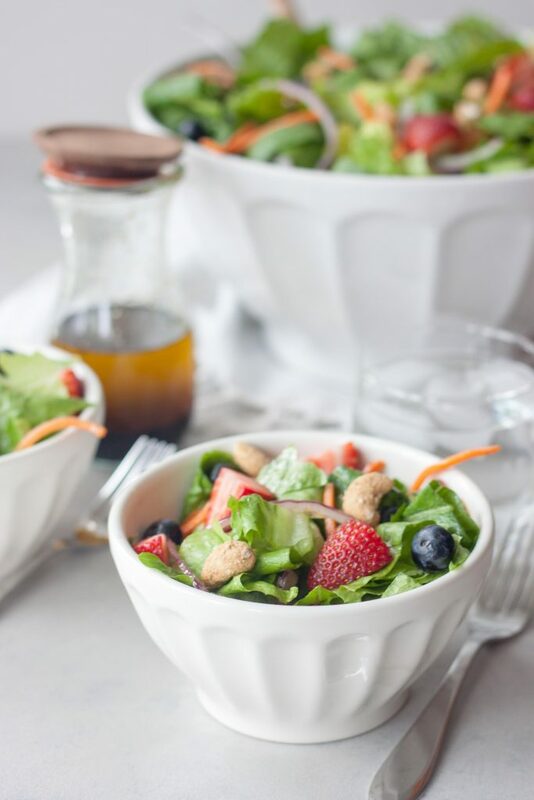 Simple and delicious salad packed with fresh sweet berries on a bed of romaine, carrots, and red onion dressed with a basic balsamic vinaigrette and topped with nuts. Great for lunch, dinner as a main or side, or your next get together for sharing. Naturally gluten free and vegan. In a glass jar with a tight lid shake together the dressing ingredients. If making ahead place in the refrigerator until ready to enjoy. In a large bowl toss chopped romaine, sliced onion, and carrots. Shake vinaigrette and drizzle just enough to lightly coat the lettuce and veggies. Add berries and gentle toss. Top with nuts and serve with additional dressing on the side. Notes If making ahead you can add dressing and nuts just before serving. I’m usually a savory salad person but when I get the craving for a berry salad I have to go for it! Oh my! I would love to have romaine growing in my backyard that looked just like that. That and an avocado tree, and I think I’d be in heaven! My goal this year and next is to grow more of my own food, honestly to me it seems like growing money in your backyard! Oh an avocado tree would be the perfect pairing to it! We have a large garden but here in the Midwest the growing season is short and we just do herbs, veggies, potatoes, onions, squash, lots of tomatoes, pumpkins, lettuce, oh and we have a lot of raspberry bushes! We just re did it last year with new raised beds and it was a little bittersweet since we had the same garden since I grew up here as a child (we bought my parents house when they moved right after we got married). 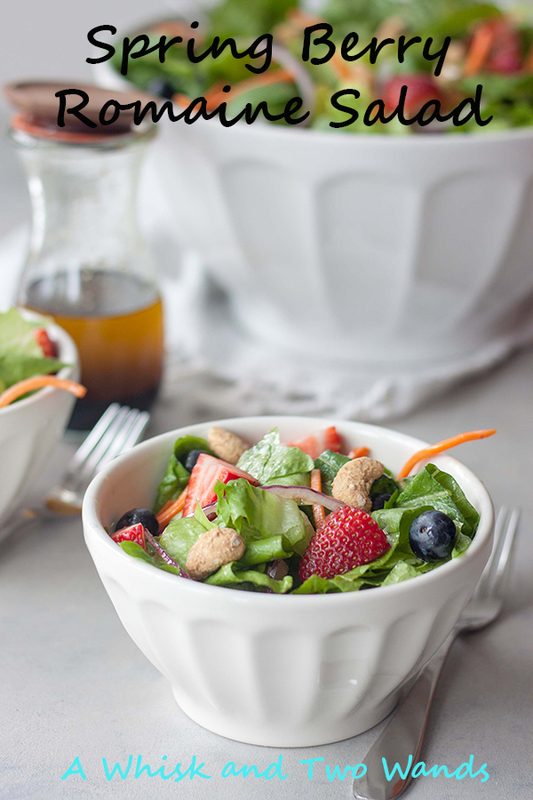 This salad looks so delicious and refreshing! Perfect to get back into the swing of things after vacay. Yes all the fresh fruits and veggies, this one makes it a little easier. It’s got my three requirements, texture, nutrition, and flavor! I hear you we have snow coming this week here in the Midwest! This salad looks so amazing and refreshing. And I’m trying to romaine calm but this has been the longest. winter. ever. I’m with you! It reminds me of the year that we got married (let’s just say many years ago the end of this week) and it was officially spring and then we got a big snowstorm on our wedding day! First thing I thought of, and heading back to California, when I heard about snow in our forecast. This looks like such a fun experience at the greenhouse. 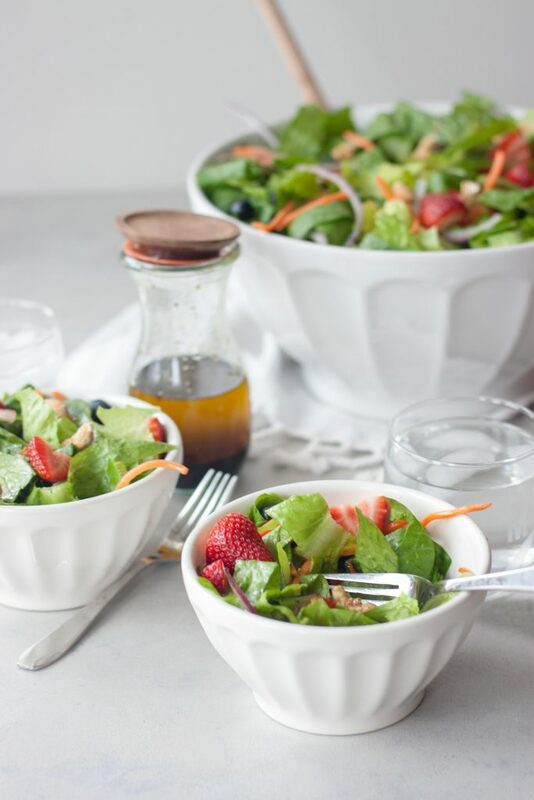 The romaine looks so fresh and delicious and I LOVE adding berries to salads, so I can’t wait to try this!!! It was fun and then today A did hydroponic planting in school so she thought that was really cool. Hope you enjoy it! 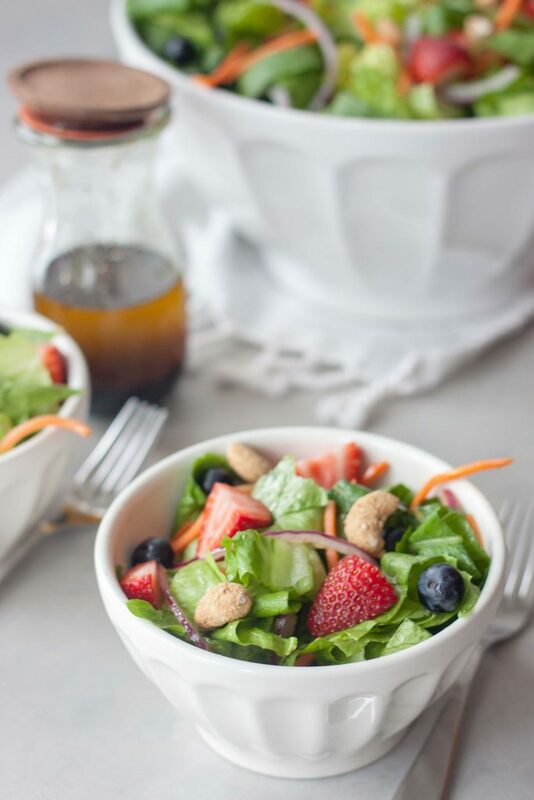 Spring berry salad sounds delicious! 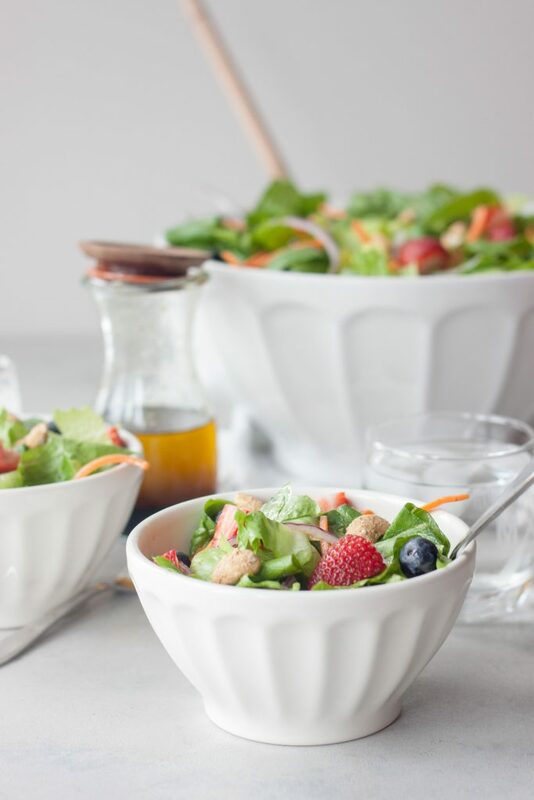 I never made this type of salad before.I always try to learn a new recipe and why shouldn’t I try this amazing recipe! This is a super simple salad with basic ingredients. Hope you do give it a try it has my 3 requirements, texture, nutrition, and flavor! Ah. I feel the same way about coming home after vacation. It’s tiring, fun but tiring. And eating at home is always so much better no matter what. This salad looks amazing! So fresh and delish! Yes eating is for sure healthier! Although we always enjoy our vacations and we stayed on the club level so we had lots of fresh fruits, veggies, and healthy options but also a lot of desserts, pastries, and wine! Seasonal spring produce is wonderful for fresh salads. Yes seasonal salads are great for so many reasons! I LOVE everything about this salad! Looks delicious! Thank you Annmarie! It’s a quick and easy and kids love it too!